UK PM Theresa May and her Israeli counterpart have jointly marked the centenary of a British pledge that paved the way for Israel's creation. 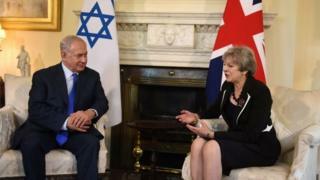 Mrs May and Benjamin Netanyahu attended dinner in London honouring the Balfour Declaration of British support for a Jewish national home in Palestine. Israel and Jewish communities view the pledge as momentous, while Palestinians regard it as a historical injustice. The UK has rejected calls to apologise and has said it is proud of its role. Labour leader Jeremy Corbyn, a long-time critic of Israeli policy towards the Palestinians, declined an invitation to attend the dinner. Shadow foreign secretary Emily Thornberry went in his place. In a speech at the dinner at Lancaster House, Mrs May warned against using criticism of Israel as a cover for anti-Semitism. "There is today a new and pernicious form of anti-Semitism which uses criticism of the actions of the Israeli government as a despicable justification for questioning the very right of Israel to exist," she said. "This is abhorrent, and we will not stand for it." Earlier Mr Netanyahu held talks with Foreign Secretary Boris Johnson. There is a huge amount of fuss being made about the centenary of the Balfour Declaration, in part misguided. 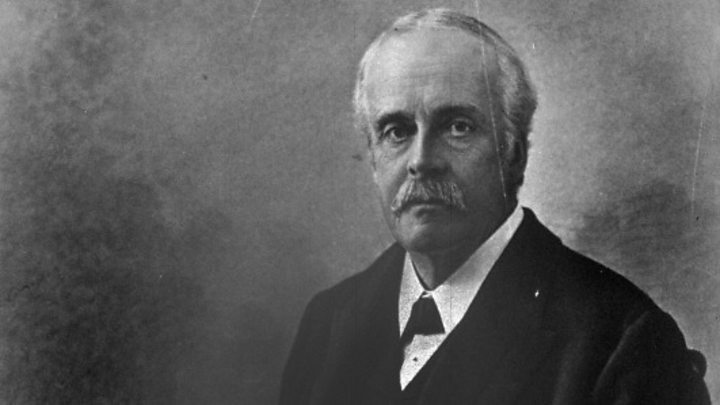 For Balfour, and indeed Britain, did not create a Jewish state. In fact in the years leading up to Israel's independence in 1948, Britain, as the mandatory power, did a good deal to thwart Jewish statehood, torn between the competing claims of Jewish and Palestinian Arab nationalism. Much of the current focus on the Balfour Declaration is due to the fact that it supports the competing narratives of the Israeli government and the Palestinian leadership. For the Israelis it highlights the legitimacy of the Jewish national enterprise, while for Palestinians, it underscores the role of the major powers in helping to create Israel, while - in their view - the legitimate Palestinian aspirations to statehood were ignored or side-lined. Thus both sides have a very different interpretation of the declaration's significance - one that serves today's arguments about one of the region's longest unresolved struggles. In the Palestinian territories, thousands of Palestinians held protest marches in the West Bank, Gaza and East Jerusalem, denouncing what they say is a betrayal which left them dispossessed. Palestinians regard the Balfour Declaration as having robbed them of their land and have demanded that Britain apologises. 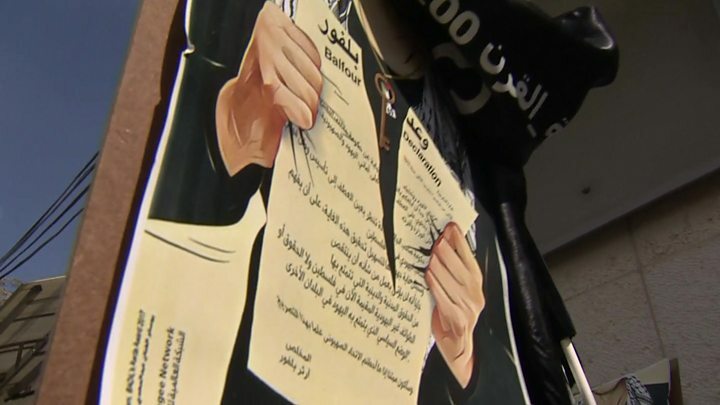 Some held black flags and called for Palestinian refugees to be allowed to return to land which became Israel. About 400 protesters from a fringe group of Jewish anti-Zionists marched from Downing Street to the Houses of Parliament, calling on "God to dismantle the Israeli State". After meeting Mrs May, Mr Netanyahu said it was time for Palestinians to come to terms with the past. "A hundred years after Balfour, the Palestinians should finally accept the Jewish national home and finally accept the Jewish state. "And when they do, the road to peace will be infinitely closer. In my opinion, peace will be achievable," he said. Media captionPalestinians ask British diplomats in Jerusalem to apologise for the Balfour Declaration. However, Palestinian President Mahmoud Abbas said the Balfour Declaration was "not something to be celebrated". Writing in the Guardian, Mr Abbas said the past was still "something that can be made right", and called on the UK to recognise a Palestinian state in territory occupied by Israel since the 1967 Middle East war, with East Jerusalem as its capital. Britain's pledge, on 2 November 1917, was made in a letter by the then-Foreign Secretary Arthur Balfour to Lord Walter Rothschild, a leader of the British Jewish community. The letter said the government viewed "with favour the establishment in Palestine of a national home for the Jewish people", so long as it did not "prejudice the civil and religious rights of existing non-Jewish communities". The Balfour Declaration was the first international recognition by a world power of the right of the Jewish people to a national home in their ancestral land and formed the basis of Britain's Mandate for Palestine in 1920. The British Mandate terminated on 14 May 1948 and the Jewish leadership in Palestine declared an independent Israeli state. In the Arab-Israeli war that followed, hundreds of thousands of Palestinian Arabs fled or were forced from their homes.